I am a die-hard baker. And I hate cooking….anyone with me? I have used my dōTERRA essential oils in baking for years and I love the way they take my dish from yum to high vibe. I am working with a foodie friend this week and helping her collate some essential oils for baking. And thought I’d share what we came up with! These are my absolute favourites when it comes to baking. I substitute the powdered spices with my essential oils. Generally it’s a drop of essential oil to a teaspoon of powdered spice BUT always start with less and work your way up. You will love certain flavours more than other depending on your palette. I tend to put more peppermint oil in my baking but when the recipe calls for clove, I dial it right back and start with a toothpick swirl and work up. Essential oils work best in raw baking where the essential oils are unaffected by heat. Heat will change the molecular structure of the essential oil so the therapeutic qualities of the oil will be reduced. There will be some therapeutic qualities left if you heat the oils by baking in an oven but it’s probably best to assume that you are using the oils for flavour mostly in this case. I love this incredible oil. I use this oil the most in both raw and traditional baking. If you are paleo or refined-sugar free or vegan or nut free and so on, this is a wonderful oil for adding flavour. Sometimes using nut or coconut flour can get a wee bit tiresome as the flavour is so strong. Cinnamon makes baking a little more “mainstream” and adds the perception of sweetness. Cinnamon Bark oil is an incredible oil for immunity- having antiseptic, antimicrobial, antioxidant, anti-fungal and antiviral properties. A recipe that showcases Cinnamon is the Vanilla Cinnamon Cookies. Ginger essential oil is another wonderful oil to use in baking. It pairs really well with Cinnamon Bark essential oil. This is a truly medicinal herb and has been used for centuries. Ginger is a tonic and has anti-infammatory, digestive, antispasmodic, analgesic, stimulant and expectorant therapeutic properties. The Paleo Maple Date Pecan Slice highlights this beautiful oil. This is a good oil to add to Ginger and Cinnamon to get that Christmassy sweet spice taste to baking. A recipe that showcases this sweet combo are the Paleo Ginger Spice biscuits. Clove oil is another incredible oil for immunity- having antioxidant, antibacterial, anti-fungal, anti-parasitic, regenerative and antiviral properties. The anti-oxidant properties of Clove are off the chart and as an oil it’s ORAC scale measurements are over 1 million. Even half a drop of this in baking will create a therapeutic high vibe dish! Peppermint works so well with chocolate and cacao and medicinally has anti-infammatory, analgesic, antispasmodic, invigorating and expectorant therapeutic properties. Lemon is a natural detoxer and assists in lymphatic cleansing. It has antiseptic, antibacterial, antioxidant, disinfectant and mucolytic properties. 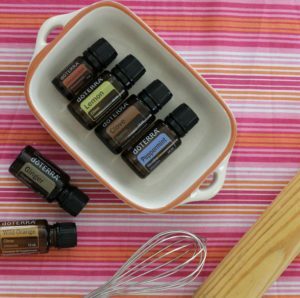 These are the 5 oils I use regularly in baking. Another fabulous oil is Wild Orange and then there is the delicate flavour of Lavender- yum!